Finally - the jacket. It's Kwik Sew 3334 with a few changes. Sorry - photographed after a day's wear. The fabric is a silk tweed, or at least that's what I'm calling it, though perhaps there is a "proper" name for this rather coarse, loose weave. Oddly enough, I kept thinking of this as being cotton, but once the steam from the iron hit it, I could tell by the smell - it's silk, all right. According to the pattern, this is an unlined jacket. Well, it would be rather difficult getting it on and off without a lining, so I changed that aspect. Left off the back facing and made the back lining piece come right up to the collar/neckline seam. Added little pockets in the front seams. (That's to keep myself from saying "What idiot didn't put pockets in this jacket?!") Added piping in the collar, at the front and at the sleeve edges, which necessitated sleeve hem facings. As for fit - I raised the armholes by about 3/4 inch, and narrowed the sleeves at the armhole, as well as removing part of the "bust bump" on the side front piece. I did not interface every piece, as instructed at the fabric store with these types of loose weave fabrics, because I wanted a very soft jacket, with the feel of a cardigan. I did fuse strips of knit interfacing at strategic seams to keep things from stretching out with wear. As for those buttonholes - probably wasn't worth all the angst. That's me, exhausted, after an all-day seminar with my head spinning. If I hadn't snapped this picture yesterday, who knows when I'd be wearing all the components together again. I thought that with the advent of warmer weather I would be able to photograph outside, which seems to give better results, but it's forever raining on and off. It's either indoor pictures, or none at all. Must say - after a whole day of sitting - the pleated pants are oh so comfortable! Here's where the pink starts to come in. The trousers (pants?). Around here most people use the word "pants". 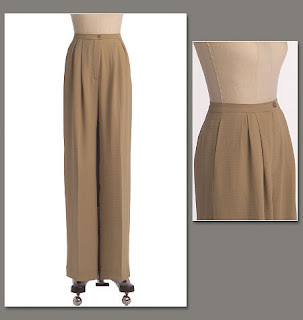 "Trousers" is hardly ever used and sounds outdated. I do remember from pattern drafting class that there are "trousers", "slacks" and "jeans". The last one is self-explanatory, but I don't think anyone makes the distinction between "trousers", "slacks" anymore. Come to think of it, I haven't really heard anyone use the term "slacks" in ages, though way back, I do remember it being used all the time. Anyone have any insights on this? From Claire Shaeffer's Custom Couture Collection - Vogue 8498. I like pleated pants. They're very comfortable. For a while, there, if you listened to the style gurus, you were committing a terrible sin by wearing by wearing pleated pants. Then all of a sudden it has become OK to wear them. Anyway... These are the first run for this pattern, though its been languishing in the drawer for some time. I did not follow all the lovely directions for a couture finish. I did not put in the pockets (which, I know, I will later regret). I did line these. Oh - and I didn't put in a "real" fly zipper, just a "mock", because I don't like having extra layers of fabric that create a bump. The fabric is "summer suiting", whatever that's supposed to mean, and has also been lying around for a bit. ( Fabric needs to "age", like a fine wine.) And where is the pink? In the stripes! Now I do have to go tackle the buttonholes on the jacket. They're the only thing left to do (well, that and sewing on the buttons). I've procrastinated, made enough sample buttonholes to outfit many jackets, and I'm keeping myself from tackling other sewing, because I'm all set up to do these buttonholes. Once they're done - I'll have a new outfit to wear! Even that thought hasn't managed to get me over my insane fear of putting these buttonholes in the jacket. Okay - not the most inventive of titles. Bear with me. I ran out of "edible" colour names for grey way back when. And the pink part - well that's not on the agenda for to-day, so we'll see what happens. I started this whole outfit way back in the winter. Summer outfit in winter? Well, the brilliant idea at the time was to sew it to hang at the store as a class sample, so that I could retrieve the wintery outfit that was hanging there already, so's I could get some wear out of it this year. Obviously that didn't happen. Life and stuff got in the way. Somehow I did manage to get the blouse and pants done some time before Easter, I think, but the jacket was just not happening. Probably too much thinking going on, which lead to procrastination, because I kept thinking of all that could go wrong. So now I'm forcing myself to get this jacket done. How? you may ask. Well, by posting the other two pieces here, which should get the ball rolling, and then I'll feel like I'm letting the whole world down (I know - the world really couldn't give a hoot) if I don't hurry up and get the jacket done and posted. (I'm a master at feeling guilty.) Actually, since I've been dragging this whole thing out for so long, it would really be nice to just GET IT DONE and hang it in the closet. Without further ado - the blouse. This is not something you do in a rush - lots of slow breathing exercises, taking your time and praying like mad that the machine isn't going to decide to hiccup somewhere smack in the middle of a row. Every so often I rather like this mindless exercise. And to finish - vintage mother of pearl buttons that just "happened to be sitting around" waiting for somewhere to go. After all was said and done, this blouse did have to go through the wash to remove all that starch, and it's still a bit stiff, but that will surely wash out the next time around. Of course, I have to finish the outfit, so that I can wear it to justify washing the blouse again. I'll show you part 2 later. Well, I'll bet you didn't expect to hear from me again so soon! on location at Joyce's Sewing Shop. Joyce decided to do a "Christmas in July" series of classes, and this is my contribution to that series. A few years ago my daughter saw the original version of these pants in a wine store. Ever on the look-out for projects for her mother to use for classes, etc., she decided that they would look even better made up in a nicer quality of fabrics than the originals, which were sort of plasticky. Well, to copy, we needed to purchase, and the only way that the bag could be had was with two bottles of wine. (I know, a real hardship.) Bought the lot, then proceeded to copy the gift bag. My version debuted a few years back at a sewing club meeting at the store. Then they kicked around for a while, until they were given away as a present - with bottles of gourmet salad dressing, not wine. Oh well. So now I had to make up a new pair as a sample. They're a bit more fiddly than the average gift bag, but... for that special person... I've also envisioned these in black, as tuxedo pants, or in a wild check as clown pants, though I've never actually done any other version. These particular pants are made from upholstery weight velvet, with buckram for stiffener. I suppose the fur could be of a shorter variety, but the long stuff is all that I have on hand. The belt and the straps are grosgrain ribbon. The bottoms of each leg (not visible) are black wool. Hopefully there will be some people wanting to make these in a class. In that batch of cottons that I last picked up was this chocolate brown wild animal print. (Really wild of me!) I wanted a skirt - with pockets. Since that New Look 6018 was lying around, I made a hybrid of the two views. The view with the pockets has a slit in the back and sits an inch below the waist. The other version has no slit, sits at the waist, and despite the fact that it is ever so slightly A-line, reads as a straight skirt. So a hybrid it was. The pockets needed some definition, so I made some black piping. And just for good measure, I outlined the top in piping too. This time around the button at the top of the zipper went on the inside of the skirt. And, of course, it needed a lining to make it easier to wear. Quilting cotton looks so much better as a skirt!